As you know, the VMware management has evolved over a couple of years. 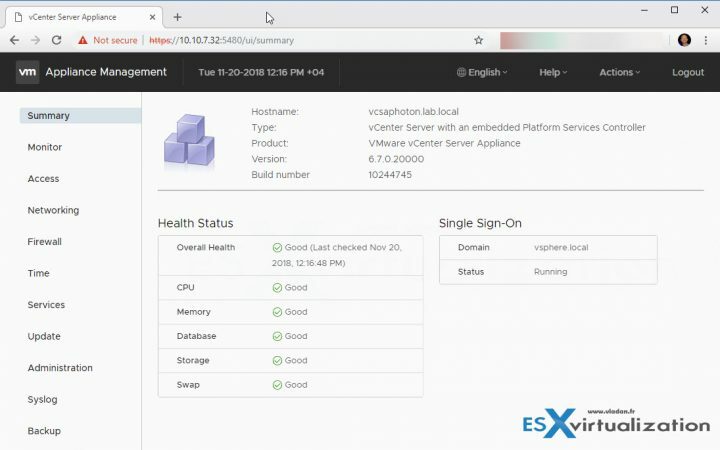 In this post, we’ll explain how and what’s changed, but also do a quick demo of How To Login Into VMware vCenter Server Appliance (VCSA) Management page. This post is destined people who are NOT VMware administrators but they just need some basic information about management of VMware vCenter Server Appliance (VCSA). If you’re VMware admin, just skip this post. In order to understand vSphere management, a while back, we have put a simple article which explains What is The Difference between VMware vSphere, ESXi and vCenter. 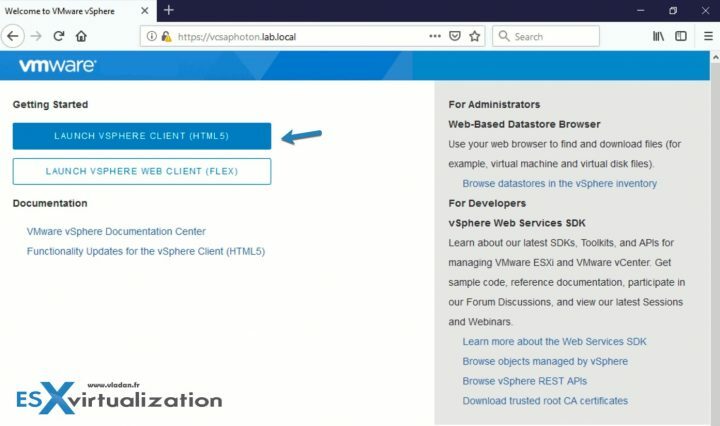 The posts explain the basics about VMware vSphere, which is basically a commercial name for the whole VMware Suite. Again, real basic, real simple explanation to people who do not deal with VMware. Here is he connection URL. 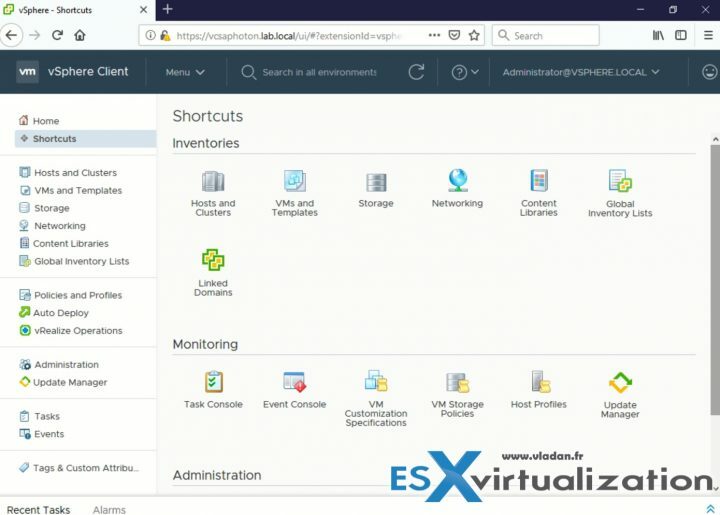 So after connection via the HTML 5 web client you’ll end up in this page where you have all the icons and all the shortcuts to manage your vSphere infrastructure. What’s the difference in one of the most popular small business packages? Usually, small business does not need too many VMs, so Essentials or Essentials plus are good bundles which exist since a long time. The differences between Essentials and Essentials PLUS below. As you can see Essentials does not have High Availability (automatic VM restart), vMotion, backup software (VDP) or possibility to add VSAN as shared storage option (separate licensing option – per physical CPU). The Essentials is good for very small clients and clients who do not really need availability. Clients which stop a VM and then move it to another host where they can start it again, to do a hardware maintenance on the first host. On the other hand, having the possibility to migrate your VMs to another host and do a host maintenance or security patching without interruption, gives you a real advantage. This can be done during business hours and users can continue to work. That’s why Essentials Plus has a much better value even if it’s more expensive. Note: Both licensing packages do have vCenter Server Appliance (VCSA). So basically you’ll have the right to install 3 ESXi hosts and vCenter where, depending of the licensing you chose, you’ll need further configuration for VMware HA, VMware vMotion and (if used) vSphere Data Recovery (backup). Also, if there is an unplanned hardware failure, vSphere High Availability (HA) can restart automatically those VMs which failed when the host failed. Those VMs are automatically restarted on other hosts which are part of VMware cluster. There is small downtime during which the system figures out which host has failed and which are the hosts that are able to start the failed VMs. Those hosts must have enough available capacity in terms of memory or CPU. Once this automatic decision is taken, the VM boots up. The whole process is completely automatic and acts without the admin’s intervention. A shared SAN/NAS storage or VMware vSAN needs to be part of the cluster. (Please note that VMware VSAN is separate product). 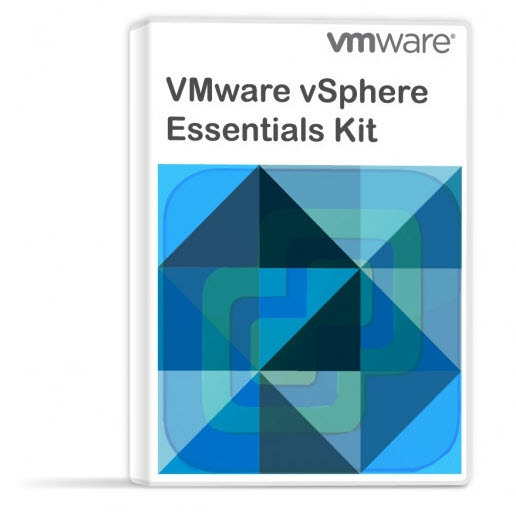 I hope that you’ve learned the real basics about VMware management, administration and tools. This post was mentioned to help other than VMware admins, about vSphere, ESXi hypervisor, vSphere management and access to the vCenter Server Appliance (VCSA) which is the main vSphere management piece. VSAN is *really* included in Essentials Plus????????????????? Where is this officially documented on vmware.com?????????? No, VMware VSAN is a separate product. I’ll update the post to clear doubts. Thanks.